Every professional appraiser builds a library of references – but mostly for gemology. Without a doubt a basic specialized reference library must include books about jewelry marks. I have several books about marks that have dog eared and well-worn pages – with personal notes galore. Not only are such books coveted by me but jealously guarded. Never ask to borrow one of my hoarded books. And one of my top special books is about world hallmarks. 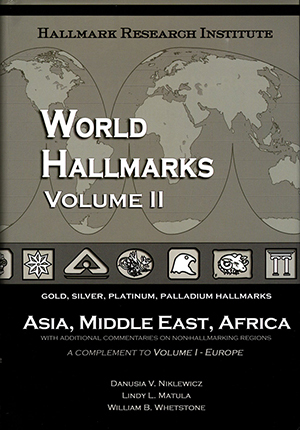 The best book of world hallmarks – unquestionably - is World Hallmarks Volume II. Add this book to your library! Being able to decipher a mark provides the appraiser with must have information, namely quality of metal, circa dates, country-of-origin and the list goes on. If you want to stay ahead of your competition, you will need to have this book at your fingertips! By the way, if you have not yet purchased volume I – that is a must have book as well.